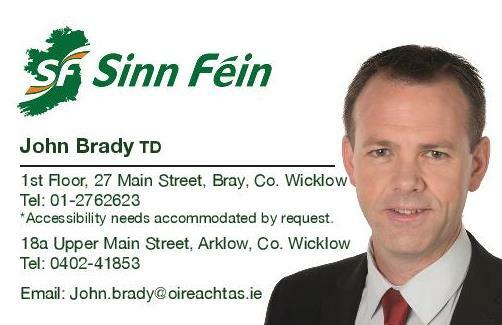 Sinn Féin spokesperson for Social Protection John Brady TD has said that Budget 2017 continues the shameful discrimination of our young unemployed. 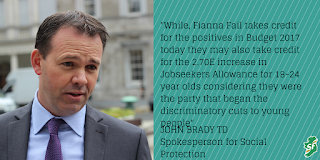 “The increases announced today as part of Budget 2017 include a €2.70 increase in Jobseekers Allowance for those aged between 18 and 24 years. This means that this weekly payment rises from €100 to €102.70. “Those aged 25 will see an increase of a measly €3.80 from €144 to €147.80. “This increase will have no impact whatsoever on our young unemployed. In fact, it will do nothing more than incentivise them to emigrate. “Once again, the Government’s Budget provides our young people with absolutely nothing. While Fine Gael and Fianna Fáil talk about Budget 2017 being about creating a fair and just society, young people do not feature. “Last week, I asked Minister Varadkar to restore Jobseekers Allowance to the full payment of €188 for under 26s. His response has been to give them a pittance.